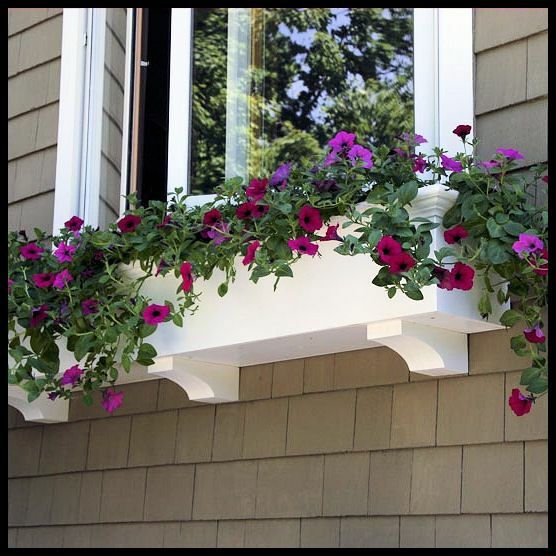 Window boxes provide a creative, easy solution to improve your curb appeal. With Hooks & Lattice planters you can bring the front of your home to life. Add a floral arrangement to bring color and pizzazz to any window! We offer modern ideas and decorating inspiration to help you transform any dull or uninviting flat surface such as decks, fences, or bare walls. You may recognize many of our designs across several brand hotels, motels and high-rise apartments in the United States. We specialize in custom designs that fit any style or space. Our on-line catalog includes wrought iron, wood, solid-core PVC and fiberglass options. If you don't find what you're looking for, call one of our customer service experts about creating a custom request for you. Explore some of our most popular styles and sizes in our video below! Improve the outside appearance of your home or business with one of our designs or custom-sizes. We're sure you'll find the perfect fit for your office, garden shed, balcony, deck, fence or space. Need an inexpensive way to differentiate your home from other similar homes in the neighborhood? Window boxes allow you to set your home apart for a minimal investment. Need to sell a home with lackluster appeal? Shop one of our copper selections or chose a seasonal custom color. If you want a box that is as popular for its good looks as its ease of planting and watering, be sure to check out our French style wrought iron window box and Lattice style wrought iron window box. Both these styles have become favorites among architects, custom homebuilders, restaurants and hotels. Add a few to your bare spaces and you'll quickly see why. Both of these designs can hold your choice of 8" flowerpots. By planting in individual pots you can easily swap plants in and out whenever you want without replanting in difficult to reach locations. Do you love the look of wrought iron but worry about rust? Relax. Our iron units and accessories feature a powder coating in textured black which ensures the best possible protection against the elements. Why deprive patios and decks of the beauty of fourishing greenery? Our products can be used on patios as flower boxes or with brackets on deck railings. If you'd prefer to plant directly into your planter just add a copper, plastic or coir liner. Whether you want to spruce up your patio or your windows, we've got an option to fit your space. Our sizes range from 24" to 72" offering you choices to fit any window or bare space. Customers with windows larger than 72" should inquire about custom sizes.